Do you have any idea about the amount of time that your workers spend in the washroom? It’s something that you might not be concerned about but when you learn how much time they actually use up while there you might change your mind. A place where people spend that much time is bound to have an influence on them. That’s the reason why Steve Jobs decided that there should only be two bathrooms in the whole Pixar facility. Jobs knew that bathrooms have the potential of bringing people together so they can exchange ideas. 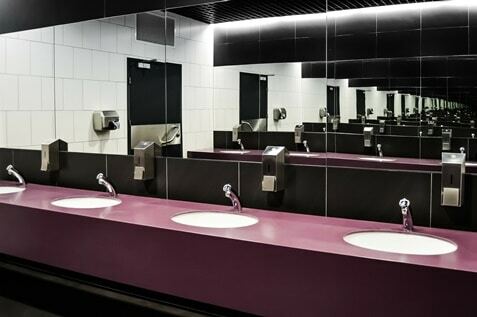 Washroom design should be a serious business since it can have a significant influence on workers. Functionality should be a main consideration, but it’s not the only thing to keep in mind. Some workers are very health conscious and they can become frustrated when something gets in the way of their good hygiene practices. One common example is when they have to touch surfaces that are handled by those who are not as a health conscious as they are. You can avoid upsetting your hygiene conscious workers and also help fight the spread of germs by using touchless devices in the washroom. Lighting in a bathroom is not just about making sure that the room isn’t dark. If that’s all it takes then all you have to do is to keep the room as bright as possible. But lighting can do a lot more. The right lighting can help reduce stress. Don’t use lights that are too bright. Dim lights can actually help to relax a person. Why not stream in some relaxing music to your workplace washroom? Since some workers go there in order to unwind, the music could help. You can use the kind of music that they use in spas for example. That is sure to make your washroom a more relaxing place or why not some nature sounds like that of flowing water? OR, you can also use some good music to energise your employees and keep them productive when they go back to their workstations. It’s a matter of setting the mood of your employees, and music can help. Have you used a washroom where you cannot figure out if the stall is occupied or not? That was an annoying experience wasn’t it? Make sure that you get stall doors that can tell users right away if it’s occupied or not. Workers would be thrilled with the availability of hot water in the washroom. That should be available at all times. If you are worried about the energy that would be wasted by having hot water available all the time, there are some environmentally friendly options for that now. Some workers get frustrated and stressed when they use the washroom and they find the toilet seats are dirty because of the people who used it before them. That sort of problem can be resolved by using seats that are kept upright so they don’t get soiled easily and by using toilet seat sanitisers. In the end you can boost the overall experience that your workers can get from using the workplace washroom when you get a managed washroom service from Alsco. Keep your workplace fresh, clean and hygienic. Get Alsco’s fully managed washroom hygiene systems now. For more details, send us an enquiry.